Swimmers young and old love a good pool slide. And who can blame them? 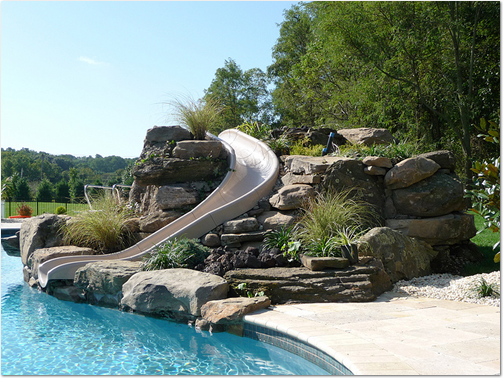 In the summer, days can be filled in the swimming pool, using the slide over and over again as your own backyard roller coaster! At Accurate Pool & Spa, we don’t want to restrict your fun, or your creativity. Our customers can choose from a selection of slide types they couldn’t even imagine! Contemporary slides, including the Cyclone, TurboTwister and the Typhoon. Classic slides, including the AquaBlast, the RocketRide and the Rogue GrandRapids. Custom slides, like the BigRide. The Vortex slide, an open-flume style that is perfect for commercial projects or those larger homes where a smaller slide just won’t do. Still not sure which slide is right for you? We can help!